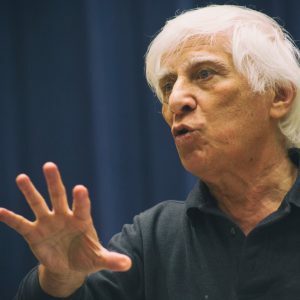 Bahram Beyzaie is one of Iran’s most acclaimed filmmakers, playwrights, and scholars of the history of Iranian theater, both secular and religious. He was a leader of the generation of filmmakers known as the Iranian New Wave, starting in the late 1960s, and has since directed more than a dozen prize-winning films. He has also conducted pioneering research into the roots of the ancient legends derived from Indo-Iranian mythology and known collectively as A Thousand and One Nights. Beyzaie teaches at Stanford as the Bita Daryabari Visiting Professor of Persian Studies and has produced several plays in the Bay Area.